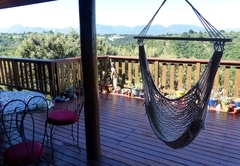 Jane's Coastal Retreat is a highly recommended property providing self catering in Ballots Bay for up to 6 guests visiting the Garden Route region. 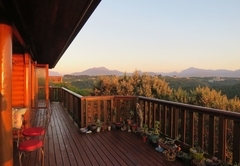 Located in the unspoiled heart of South Africa's famous Garden Route, this beautiful three bed roomed wooden house is situated in a private nature reserve and surrounded by Cape Floral Kingdom vegetation and fynbos forest with ocean, forest and expansive mountain views. 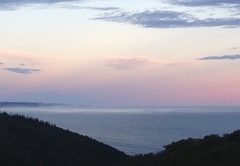 The protected nature reserve is covered with a mixture of fynbos vegetation and indigenous forest and is home to a myriad of birds and wild animals from bush buck to a small herd of Zebra. 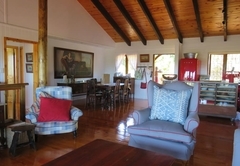 Jane's Coastal Retreat holiday house has a central open plan living space with a glorious double volume ceiling. 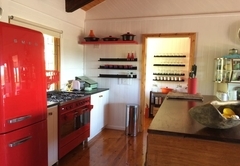 It contains an exceptionally well equipped kitchen with a large Smeg gas stove and a beautiful Smeg fridge. A fantastic selection of spices and top quality Le Creuset pots make cooking a pleasure. Adjacent to this is a six seater dining area and a comfy contemporary lounge space. The house is well stocked with games, books and music to speed up relaxation! Three bedrooms lead off the central heart of the house. 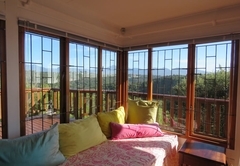 The giant main bedroom has deck access with mountain views and a full bathroom en-suite. 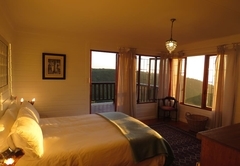 The two additional rooms are both sea facing - one with deck access. They share a full bathroom with bath and shower facilities. Both the main bedroom and the second bedroom have queen size beds while the 3rd bedroom has two single beds. All are made up with deliciously fresh crisp cotton linen. Along the entire front of the house is a wooden deck - great for outside el fresco cooking and relaxing. There is a Weber braai on the deck, a string hammock chair to curl up in, as well as a seating area for outside dining. 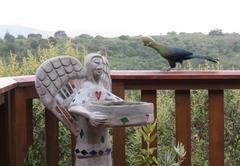 Birds love this house - among others, the Knysna Lourie can be seen drinking from the bird bath on the deck, owls regularly roost in the eaves and the beautiful Cape Sunbird flits around the fynbos surrounding the house. 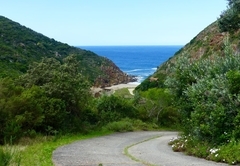 There are wonderful hikes and trails throughout the reserve - one can walk down to the secluded Ballots Bay where the Moulen River flows into the sea and enjoy a braai or a paddle in the ocean, or hike along the cliff edge and down to tidal rock pools filled with muscles and other sea life. If you are feeling too lazy to cook, Wilderness town with it’s abundant international standard restaurants is a 10 minute drive away. 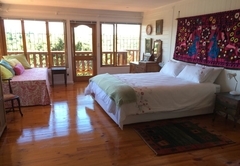 Jane's Coastal Retreat holiday house has a central open plan living space with a glorious double volume ceiling. It contains an exceptionally well equipped kitchen with a large Smeg gas stove and a beautiful Smeg fridge. A fantastic selection of spices and top quality Le Creuset pots make cooking a pleasure. Adjacent to this is a six seater dining area and a comfy contemporary lounge space. The house is well stocked with games, books and music to speed up relaxation! Three bedrooms lead off the central heart of the house. 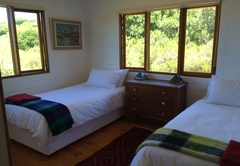 The giant main bedroom has deck access with mountain views and a full bathroom en-suite. 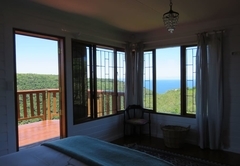 The two additional rooms are both sea facing - one with deck access. They share a full bathroom with bath and shower facilities. Both the main bedroom and the second bedroom have queen size beds while the 3rd bedroom has two single beds. All are made up with deliciously fresh crisp cotton linen. Along the entire front of the house is a wooden deck - great for outside el fresco cooking and relaxing. 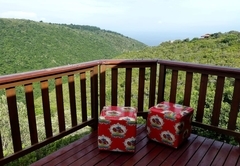 There is a Weber braai on the deck, a string hammock chair to curl up in, as well as a seating area for outside dining. Child policyAll ages of children are welcome on prior arrangement.